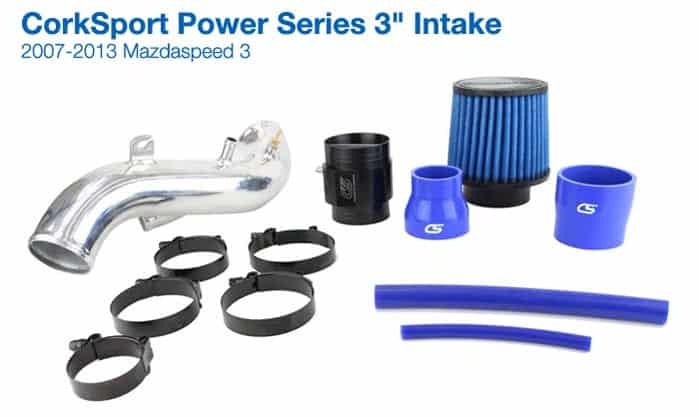 Dramatically reduce intake restrictions and get an impressive improvement in power throughout the entire RPM range with the CorkSport Mazdaspeed Power Series 3" Intake System. The Mazdaspeed True 3" Intake System is fabricated with a high polished 3 inch turbo inlet pipe and a true 3" inside diameter MAF housing. The velocity stack design smooths air flow for maximum performance. If you plan on upgrading or have already upgraded your turbo this upgrade is a must to keep your MAF sensor functioning within its calibrated range. Up to a 35% increase in air flow over the OEM Maf housing. True 3" MAF: Machined with a True 3" inside diameter MAF. Turbo Inlet Pipe: A precision high polished 3" aluminum turbo inlet pipe..
** 07-09 Mazdaspeed 3 and Mazdaspeed 6 must make ecu or battery modifications for fitment. ** Does not fit with CorkSport cold air box. ** This system is not CARB approved.. Very nice piece. It fit perfectly and I was very careful not to scratch the tube as the finish is flawless. The silicone is tough and the clamps are wicked. I love the sound of the turbo now, I had a 2.5" Mazdaspeed Intake before and sounded more like a pissed off blow dryer, this intake sounds great. The flare for the bypass valve hose is large so I really had to wrangle on the Corksport replacement bypass valve hose. Its never coming off!!!! Really sets off the engine bay. Quality fit and finish were as expected from corksport, perfect as always. Sounds great and looks almost stock under hood. However this intake with corksport's upgraded turbo does not fit with the stock ecu/battery box. this is a must! great quality and color options! Not much I can say about this intake, other than its amazing; works and looks amazing. The Corksport intakes are very well made items. I had the regular stage II before this one. Both are great. It will most definitely be one of the sexiest thing under your hood. Oh baby this looks sounds and feels awesome, unbelievable change to the car...she's a whole new beast! Wow, talk about a tight fit. Great job on not requiring a ECU relocate. Upgrading from the regular CS power series intake I must say, this baby frees up a lot of restriction on the turbo. After installing this intake I was able to lower my WGDC by at least 20% across the board. I have no longer have a problem of hitting and maintaining my boost targets. Keep up the good work! Difference between this and the power series 3 intake? Can I use this on a completely stock car? Does this not fit on the 06 mazdaspeed6? Will this fit with the sri/fmic piping? We have not test fit the intake with the Cx7. Based on the layout and our Stage II intakes you would need to adjust the transmission dipstick tube to get clearance on the pipe. Versatune software can be used with it if you scale the MAF settings in the software. Will the 3 inch intake work with your FMIC for gen1 Mazdaspeed3?? Can I purchase an extra filter when ordering this intake? Thanks. 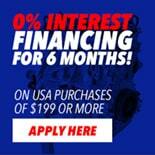 Yes you can, you can give our sales team a call or when you place the order put a note you want an extra filter and we can contact you to get that taken care of. Are there any plans to get this intake CARB certified in the near future? Hi does this product need addition items to be purchased with or does it work on oem parts? You will need an accessport to be able to recalibrate the MAF for the larger housing. Well I got my intake today. I installed it with with no problems, but hard a hard time getting the bypass hose to stretch enough to fit on to the turbo inlet. But my biggest problem is I have no way to calibrate the maf. Cobb no longer has "cobb tuner race" what is my next option??? Kyle, Look on the forums for a download for the ATR. Versatune also offers software which allows you to tune your speed as well. You can make a MAF cal adjustment for it using ATR. However, Cobb has taken that away from us temporarily. What battery modification is required for the MS6? None at all. You should be able to bolt on with no problems. Just make sure to adjust your MAF scaling if you do upgrade to a 3" intake. What battery/ecu modification is needed for the MS6? You should definitely consider getting HPFP internals upgraded if you plan on getting this intake. What would be the cause of me not getting the Maf sensor with this. Is it an urgent thing to get it right away? You have to make sure you do a MAF recalibration. The piping is larger than stock which means if you don't do the MAF calibration, the car can run poorly. I highly recommend having a tuner make that adjustment. What's the difference between the power series and the stage 2 short ram. The Stage II SRI will include the TIP and the SRI retaining the same diameter piping. This intake is a 3" intake which means you will need to make sure and do a MAF recalibration. So can the coupler fit on a GTX3076R turbo? This intake includes a 3 inch to 4 inch adapter for large turbos which have a 4 inch compressor cover. Does this come with a coupler for a BNRs3 or a bigger turbo ? It includes a coupler for a big turbo but not the bnr. Can this be ran without tuning or maf recalibration? It cannot, you need to re-scale the MAF in the ECU. Will this intake ever get CARB approval? We do not have plans to get CARB testing completed as the only way to get it pass the test would be with a tune. I am looking into getting this 3in power series intake and you guys don't have the battery box relocation kit for the 2009 MS3, will I need it to fit this intake? Do you have pictures of the ECU/battery box mod that needs to be done with this install? Your help would be greatly appreciated. You would need to remove the ECU cover to get the extra clearance for the intake. Will this fit with your front mount intercooler? Does the intake fit the mazdaspeed 3 and 6? Any adapters? Does the speed 6 and 3 use the same intakes ? The intake fits both the Speed 3 and the Speed 6. The Speed 6 required a battery modification. Is there some real power benefit (with stock turbo) comparing with CS Stage II Power Series Short Ram Intake? With a custom tune the 3" intake can flow more air which will give you more power. With just a MAF calibration and not a full custom tune it will give you very small power gains over the Stage II.